1. Their mechanical spring characteristics far surpass all other gaskets in the industry. 2. They offer the highest EMI shielding effectiveness. Leader Tech has been designing and manufacturing Fingerstock Gaskets since the early days of the computer and electronics industries. We combine these years of manufacturing and EMI experience with one key ingredient– the needs of the customer. Our innovative Fingerstock Gasket designs are a direct result of our experience and customer input. Our Compact PCI line of EMI Gaskets is an example of a design that was driven by the needs of a customer and evolved into a line of gaskets that meet all the requirements for Compact PCI faceplate standards while providing superior mechanical and shielding performance. Leader Tech offers many standard off-the-shelf Fingerstock Gaskets as well as the engineering and custom manufacturing experience to help you solve your application. Whether you need one prototype or a large quantity order, our team at Leader Tech is available to respond to your needs. EMI designers know and trust the consistent performance of Fingerstock (CuBe) gaskets. To date, CuBe yields the best electrical spring contact available in this industry. 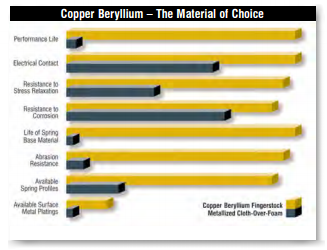 The copper beryllium mills have well established techniques and for decades have produced CuBe alloys per ASTM, SAE, JIS, and DIN specifications. 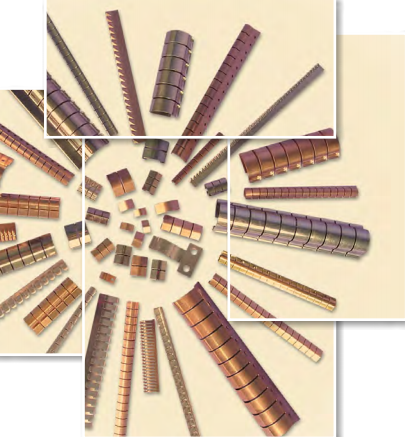 Leader Tech uses only proven technology in creating copper beryllium springs, contacts and gaskets. Beginning with Alloy 25 (1/4 hard) BeCu, we stamp, form, and post heat-treat to a hardness of 340 to 390 DPH. This process is preferred in the EMI shielding industry because it has proven to produce the best electrical spring contacts. Leader Tech CuBe EMI shielding gaskets are the most reliable in the industry. Leader Tech manufactures a wide variety of standard styles and sizes of CuBe gaskets. These gaskets operate in spaces from .010 inches up to .410 inches. Using CuBe materials as thin as .002 inch, we also offer many styles as soft gaskets that provide the low compression force needed in many applications. Leader Tech also designs and manufactures custom spring contacts and gaskets.